Since posting this overview, I’ve received inquires asking for more resources to learn more about the OKR process. One very interesting view is from the book In The Plex: How Google Thinks, Works, and Shapes Our Lives . I highly recommend it for context around the OKR process. I’ll post more resources soon. If you’re looking for more resources outlining the OKR process, In The Plex is a great read. One of the reasons I have not been blogging much the past few weeks is because of how busy things are at MindFire. We are in the midst of a pivot to a new market segment with our multi-channel marketing automation platform, and anyone who has been through this before knows how hard it can be to repoint an organization that has years of built up momentum. Exciting — but lots of work! In late 2012, I flirted with the idea of using a method that Intel, Google, and others use for creating organizational focus and alignment, called Objectives and Key Results, or OKRs for short. In a nutshell, the process starts by defining what is most important to the organization (as a whole), summarized in a handful of Objectives (somewhere around 3). These are the key things the organization needs to do to. For each Objective, there are a set of Key Results, which are measurable aspects of the Objective. The Key Results allow you to define what success looks like. Then, each functional area breaks apart the organization’s Objectives, and figures out how they will carry them out. This results in an OKR for each functional area that is aligned to what the organization aims to achieve. Lastly, each individual creates their own personal OKR, which aligns to their functional area. There’s a lot written about the process and its benefits, so I won’t go into great detail here, but not much is written from the perspective of a practitioner. In other words, what is it like to roll it out? Where do you start? What are the problems that pop up? How do you actually get it done? I’ve done a lot of looking around, and I have not been able to find anything that provides details into real-life implementation. If you know of a resource, let me know in the comments. Because of this, I have documented the process from the start, writing down my thoughts and insights, objections from our teams and people, and methods we’ve found that help carry out the process. This gem is part of the Google Ventures Startup Lab‘s body of content, explained by current Googlers, and other technology execs; aimed at helping startups navigate things like A/B testing, holding productive meetings and more. While most of these talks are private, Google Ventures is gradually posting a number of these discussions online for all entrepreneurs to access. In the video below, Google Ventures partner Rick Klau, who runs the Startup Lab with Ken Norton, covers the value of setting objectives and key results (OKRs) and how this has been done at Google since 1999. Klau, a former Google company employee himself, recalls the story of Kleiner Perkins’ partner and early Google investor John Doerr visiting the company early on to explain a method of setting goals he has witnessed at Intel (as told in author Steven Levy’s book, In The Plex). What’s super interesting about Klau’s presentation is that he found the actual deck that Doerr used when presenting to the Larry, Sergey, and the rest of the Google team in 1999 (around 7 minutes in). I plan on sharing more details in upcoming posts around what it is like to roll this out, and how it fits into defining your corporate culture. What do you think? Have you used OKRs, or rolled them out to your organization? If you’ve never visited TED.com, you really need to take a look. It’s filled with glorious ideas that are candy for your brain. Each speaker does a short presentation (no more than 20 minutes) on a very specific topic. It’s easy to get sucked in for hours listening to different thought-leaders. One such presenter and topic is Simon Sinek and his “Golden Circle” philosophy. In a nutshell, Simon believes that people don’t buy what you do, they buy why you do it. He argues that for leaders to inspire action from their employees, customers, or anyone else involved in their mission, they have to successfully communicate the why behind their ideas. Martin Luther King, Jr. gave the ‘I have a dream’ speech, not the ‘I have a plan’ speech. Simon has written a book called “Start with Why: How Great Leaders Inspire Everyone to Take Action,” where he lays out a process for getting to your why. If you have a moment, watch the video (18 minutes); I think you’ll find it worth your time. What do you think of this concept? Are you interested in what makes certain people and organizations more successful than others? Have you ever wondered what they do differently than you? I don’t believe there is one magical formula, but I do think there are certain tactics that successful organizations and people have that contribute to their success. A topic I’ve discussed a few times is how to get your company aligned behind a common set of objectives. I’ve described the V2MOM method (used by SalesForce.com to become a multi-billion dollar SaaS company), and our practice of daily stand-ups. Both these tactic have been very helpful. 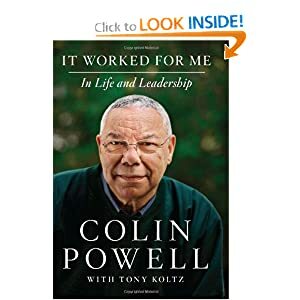 In line with yesterday’s post about handling problems as a leader, I thought it appropriate to share how Colin Powell instructed his staff to bring him problems. Being a retired four-star general in the United States Army, and having served as the 65th U.S. Secretary of State (under President George W. Bush) from 2001 to 2005, Mr. Powell definitely knows a thing or two about running organizations at scale and getting the best from those around you. First, tell me what you know. He advises asking your team to give you the facts of the situation, as objectively as possible. He doesn’t want personal interpretation. He’ll often probe to see how the facts were obtained to ensure that the data are as accurate as possible. Second, tell me what you don’t know. As important as communicating the known facts, Colin advises asking for clarity around what is unknown. If you have the right people in the right positions, they’ll most likely realize what they don’t know. Colin feels that getting people to articulate these things is as important as getting the facts. The unknowns give way to follow-up actions to obtain that information (if possible). Then, tell me what you think. This is where the person is asked to add their interpretation of the data, provide insight based on experience, and/or anything else they think is relevant given the situation. This is where he allows people to use the facts to build an argument, or offer an opinion. And remember: Always distinguish one from the other. Colin suggests that it is imperative to ensure that you are clear in asking that people provide you information and clearly distinguish which type of information they’re giving. If they’re telling you what they think, don’t allow them to misconstrue that as a representation of the facts. I think #4, while subtle, is brilliant and essential. Especially when situations are stressful, I notice that people tend to add color to a situation by incorporating their personal perspectives, which in some cases is wrong or biased. I know I do the same and wrestle with trying to keep these things separate in my own head; perhaps it is human nature to immediately draw conclusions (did I just jump to a conclusion there?). What do you think of Colin Powell’s 4 Rules? Do you think they are helpful in communicating information and getting to the point? What If You Gave Yourself Permission To Rest? Like many of you, I’ve worked hard all my life. I expect those I work with to do the same. As I’ve gotten older and the demands on my time have continued to increase, I actively ask myself whether (or not) I’m working on the right stuff. Is what I’m doing right now going to make any difference? Similarly, when asking others to do something, I try to ensure they are like-wise focused on things that matter. I’d hate to contribute to someone else wasting portions of their life. Another way to look at this is that I don’t like to generate make-work. Make-work is the crap we do that consumes our time, but doesn’t really move us forward. It may make us feel good, since we’re working and moving around, but it’s really unnecessary and doesn’t make a darn difference. As the past 48 hours have once again reminded me, a complete life includes much (much) more than just work. And certainly a lot more than make-work. We need our families. We need time to rest. We need to cultivate outside interests and hobbies. We need time to learn something new. And we need the time and space to pursue these things. That’s why I believe it is important to cultivate a spirit and discipline of sabbath, both literally and figuratively. Don’t run if you can walk; don’t stand up if you can sit down; don’t sit down if you can lie down, and don’t stay awake if you can go to sleep. Where can you cultivate this spirit in your life? What would happen if you gave yourself permission to rest? One area that we spend a lot of time thinking about (and working to improve) is our ability to communicate our company’s direction in a way that aligns everyone. We use the word “alignment” a lot around the office, and we’ve made a number of changes that have helped us improve in this area, like daily stand-ups (video example here). Alignment is critical for start-ups and companies going through rapid growth. In “Behind The Cloud“, Marc Benioff (co-founder of Salesforce.com), shared the V2MOM planning process he and his team used to grow Salesforce.com into the largest SaaS company in the world. The acronym stands for vision, values, methods, obstacles, and metrics. The purpose of V2MOM is to create alignment, from the leadership team out to every team member. Should Our Egos And Positions Be Kept Separate? A way of thinking and living that I’ve been trying to cultivate is the idea that our positions (meaning our beliefs about an issue), and who we are as people (our ego, for lack of a better word) — are two separate things. In other words, if I allow my ego to become tightly coupled to an idea or position, it is easy to lose objectivity and the pursuit of the higher truth or reality. This can look like trying to prove you’re right just because you’re the one with the idea. We’ve all been there. Further, if your position is later refuted or proven wrong, it’s easy to become emotional and feel a lack of worth as a person. These feelings can haunt us and further corrode our ability to think clearly. Foster a culture where ideas are the things that may be right or wrong, not where people are good or bad because of their ideas. Don’t attack the person, but rather seek to understand why they believe the idea is true. Instead of going after the person, keep in mind that it is likely they have reasoning that seems perfectly logical to them, and that you need to uncover those reasons in order to fully understand the idea. Be open to the idea that your position may be flawed. Lead by example in actively seeking input from a variety of sources to gain perspective. Don’t attach your personal ego to the position, but float the idea as a thing of itself. You may begin to see others doing the same. Build a culture where the data are used to get at what is true. Otherwise, you may run the risk of succumbing to your own weaknesses and blind spots, or the opinion of your HIPPOs (Highest Paid Person’s Opinion). Data can become the great equalizer, helping you get to what is true and beyond personal biases. What else? Do you believe that keeping our egos and positions separate may help us make better decisions? If not, why? I’m not a negative person, but here’s something I’ve noticed: projects fail at an alarming rate. One reason seems to be that people are afraid to speak up during the planning phase. Unless you’ve fostered a safe environment that encourages people to raise issues, concerns may fester in silence and only become evident when its too late. At MindFire, we’ve been using a daily stand-up meeting for our multi-channel marketing automation platform. We’ve also applied it in other areas, including our Leadership Team, which does its stand-up at 11:00 AM. 1) We start promptly at 9:00 AM. We experimented with having the meeting at 4:00 PM, but meeting towards the start of the day seemed to work better. I personally enjoy the buzz from getting everyone together in the morning, hearing the prior day’s activities, and charting the day’s course. As I walk into the meeting, I make it a point to greet everyone, shake hands (or a quick fist-bump), and look everyone in the eye and smile. I don’t always succeed at this, but I like to try and give everyone a good start to the day. I feel it makes a difference. 2) We time-box the meeting to 12 minutes. We use an iPhone timer to keep us honest. These days, we usually finish with about a minute to spare. We used to get lazy and go for 20 or 30 minutes, but now that we stand up and use a timer, we’re good. I check the timer from time-to-time during the meeting and sometimes call out the number of minutes remaining. Even though each person only has a few minutes, you’ll notice that it doesn’t seemed rushed; everyone has plenty of time. The Product Owner (me). I report on both my product-related tasks, as well as whatever I’m working on with the Leadership Team or any other part of our company. If someone listens carefully, they can get a pretty good sense for what’s going on elsewhere in the company. Our QA lead, who also is involved with our Professional Services. He goes first, and you’ll hear him mentioning working from home the prior day. We do this from time-to-time to improve focus. Our senior architect and 3 engineers, each of whom are responsible for a different sub-system. A member of our Support Team, responsible for communicating Clients issues, escalated cases, and any other meaningful data (we use SalesForce.com to track all cases). We added this person to our daily stand-up just recently, and we’ve already seen it pay dividends. Even though we go in the same order each day (and it is written on the board! ), I often forget. Senior moment! 4) We stay fairly disciplined. If something comes up during the meeting that requires additional discussion, we’re disciplined about putting it in the “parking lot” and discussing it later. I have to resist asking a lot of questions; you’ll see me ask a few quick ones, but I try to keep us focused and moving forward. If anyone is blocked, it’s my job to make sure that I do what I can to move them forward. You’ll hear me ask about blocks after some of the updates. 5) We update the Sprint board. We usually start updating User Story status (as a percentage towards completion) a few days into the Sprint, once we’ve started making progress. We recently changed what we display on the board, and it seems to have made an improvement. We can cover that in another post. The meeting runs well if everyone is prepared (which is most often the case). Some come prepared with a summary of what they worked on, others seem to have great memories and can recite their work without notes. Personally, I write everything down in a Google Doc, and just reference this document during the meeting; otherwise, I’d never remember anything — maybe I’m getting old! Here’s the video from one of our recent Scrum meetings; excuse the brief interruption around 1:45. Enjoy!